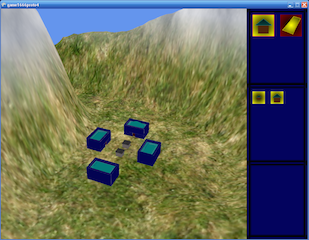 game1666 was a technology demo I implemented whilst I was at SunGard to explore how to write city-building games (i.e. something a bit like the Caesar games or Master of Olympus). Key features included quadtree-based terrain picking for building/road placement, and resource matchmaking for organising supply/demand of workers/commodities in the city. Note: The above screenshot is from a slightly outdated version of the demo, so it doesn’t show any roads or moving entities. I plan to update it at some point.